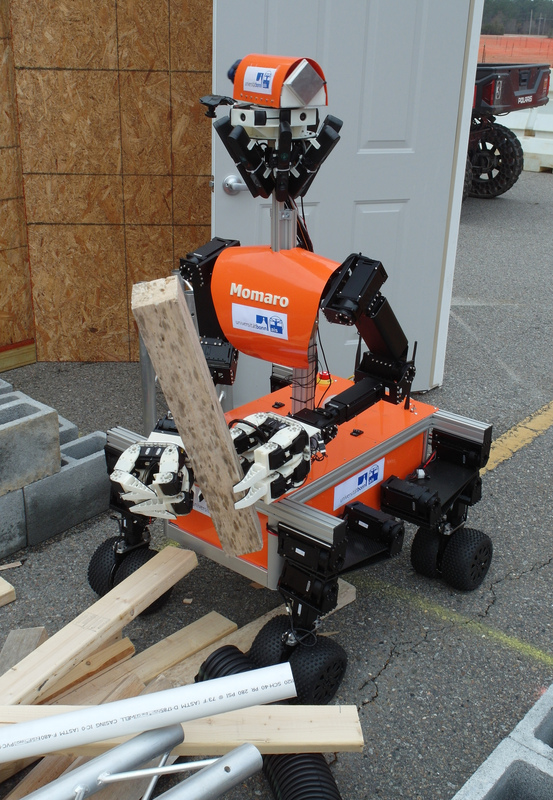 Our mobile manipulation robot Momaro has been specifically designed to the requirements of the DARPA Robotics Challenge. 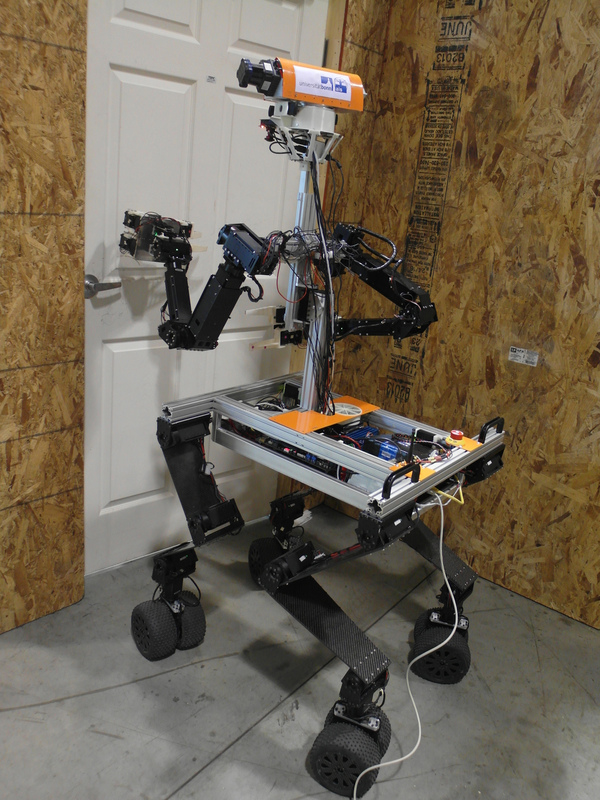 It consists of an anthropomorphic upper body on a flexible hybrid mobile base. 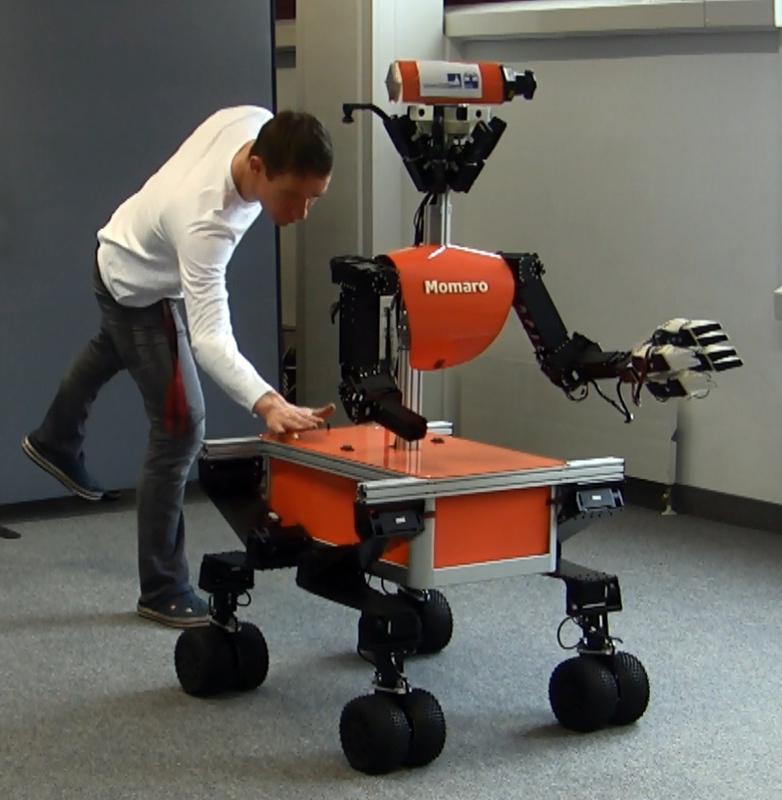 Its locomotion concept is based on four compliant legs which end in pairs of directly driven, steerable wheels. This allows for omnidirectional driving on rugged terrain and for adjusting the height of the upper body. 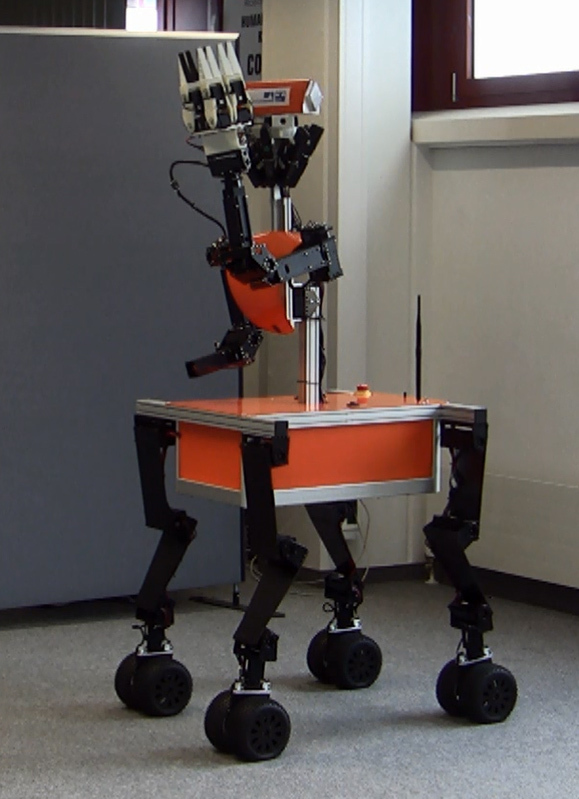 To overcome larger obstacles and to climb stairs, individual legs are lifted and the robot makes steps. 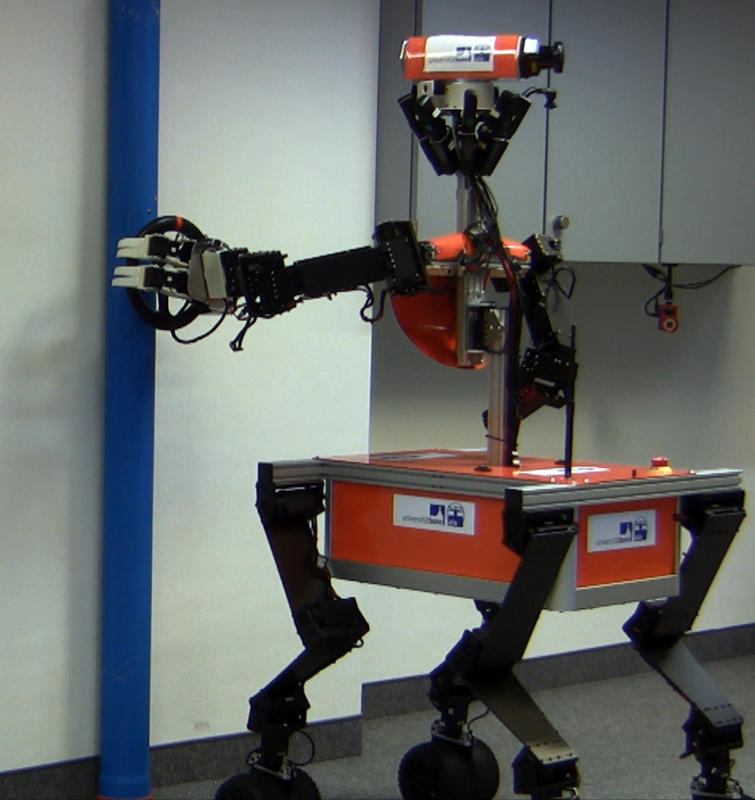 The upper body consists of two adult-sized anthropomorphic arms with seven degrees of freedom each. 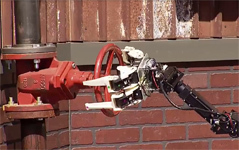 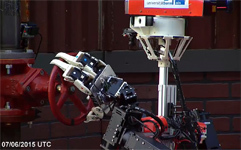 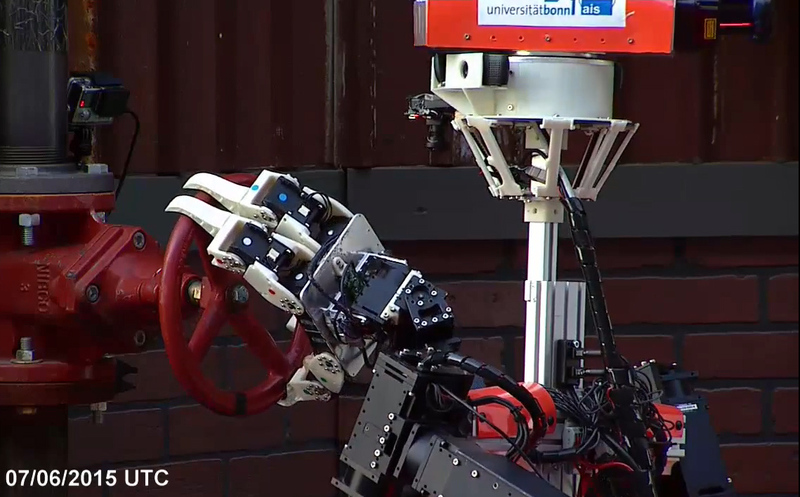 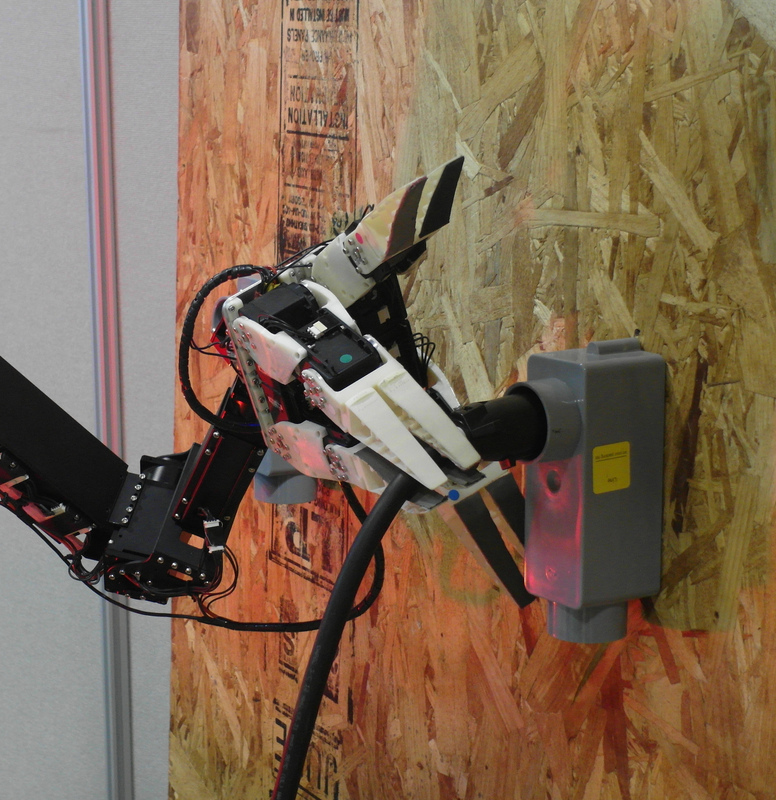 The robot grippers have four individually controllable fingers with two joints each. The robot upper body can be twisted relative to the base, to extend the manipulation workspace. 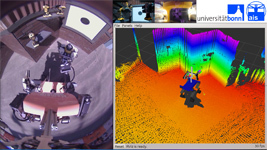 Momaro is equipped with a sensor head consisting of a continuously rotating 3D laser scanner, which produces a spherical field-of-view, eight RGB-D cameras with an omnidirectional field-of-view, three full HD color cameras for a panoramic operator view, and a top-down wide angle camera. In addition, the robot can sense joint positions and torques and is equipped with an inertial measurement unit. 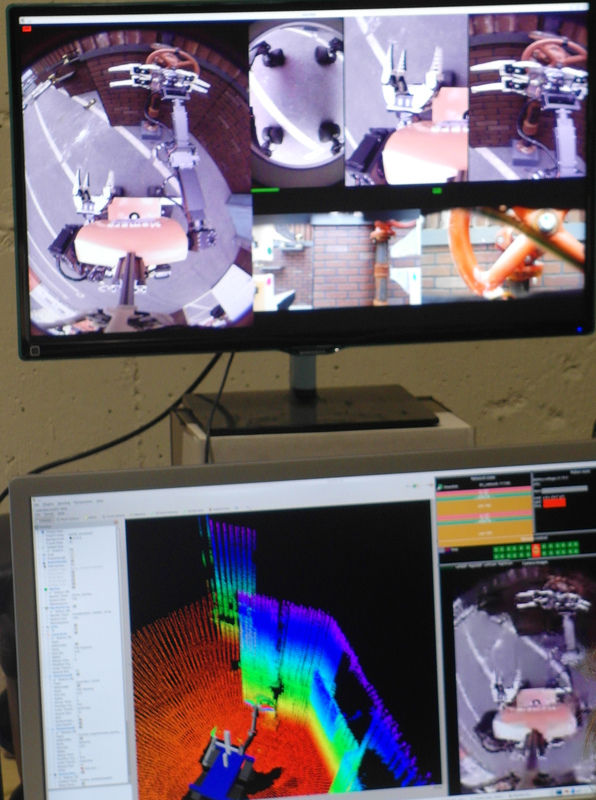 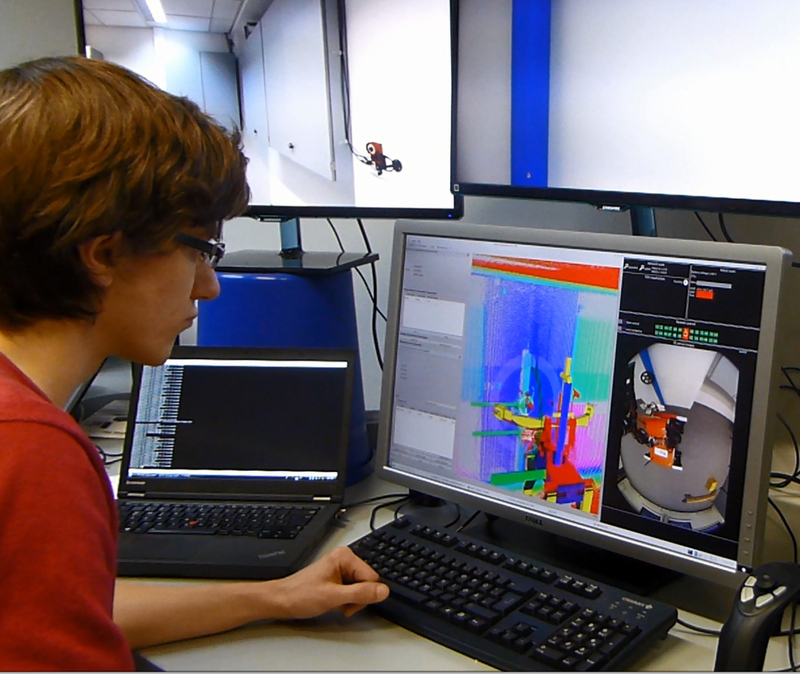 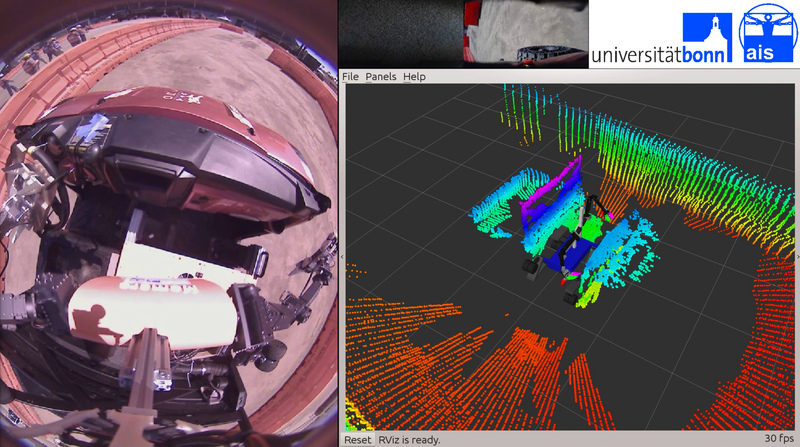 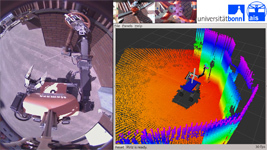 The operator station supports various 3D visualizations of the robot in its environment, panoramic and top-down video, and the interactive configuration of semi-autonomous locomotion and manipulation skills. 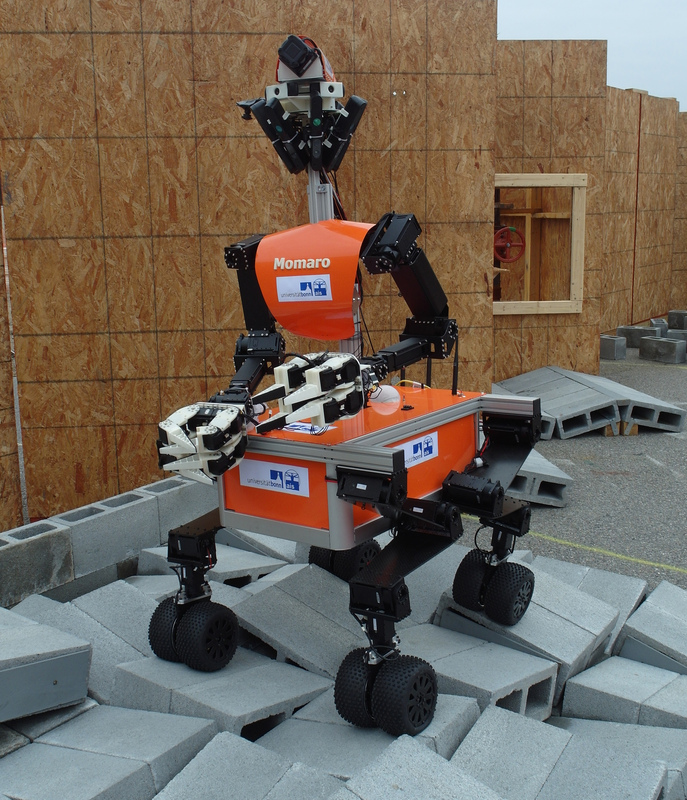 has been accepted for IEEE International Conference on Robotics and Automation (ICRA), Brisbane, Australia, May 2018.
had been accepted for publication in: The Darpa Robotics Challenge Finals: Humanoid Robots To The Rescue, Springer Tracts in Advanced Robotics (STAR), vol. 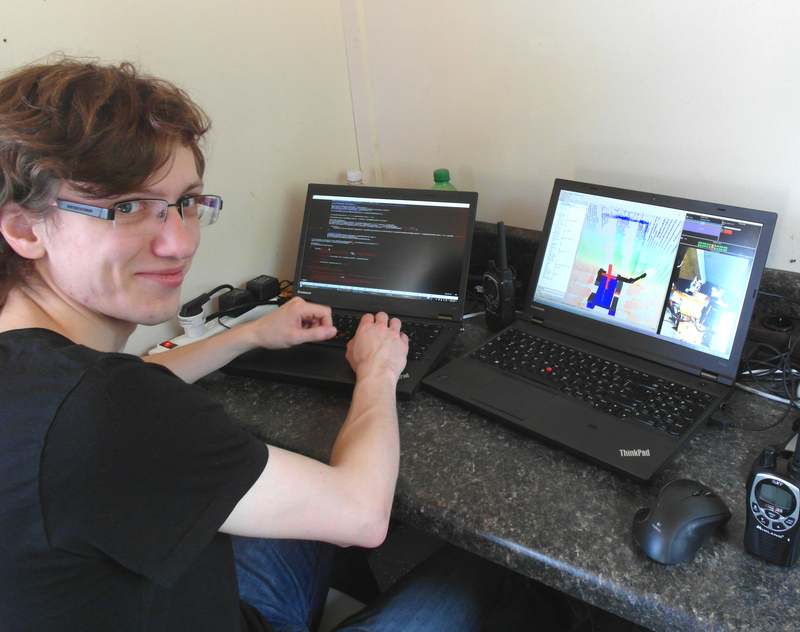 121, pp. 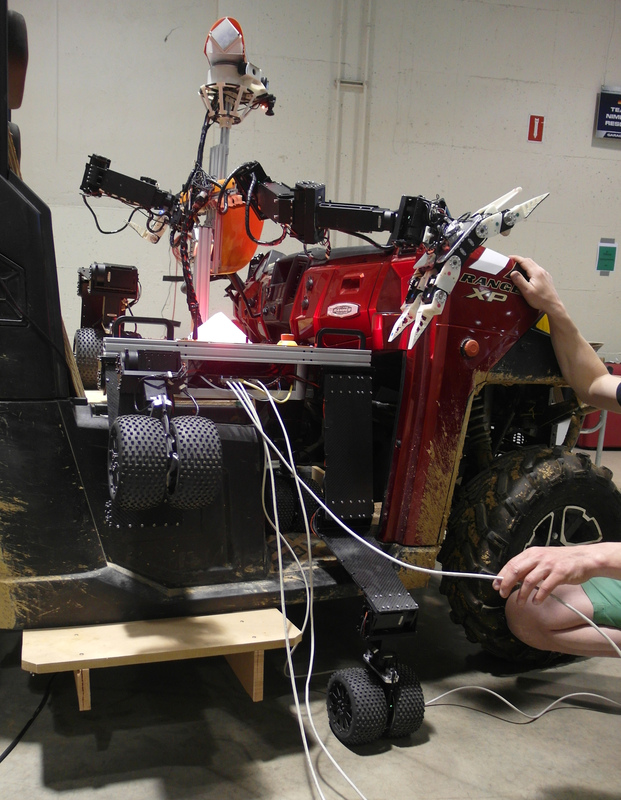 145-190, 2018.
has been accepted for publication in the Journal of Field Robotics (JFR), Wiley. 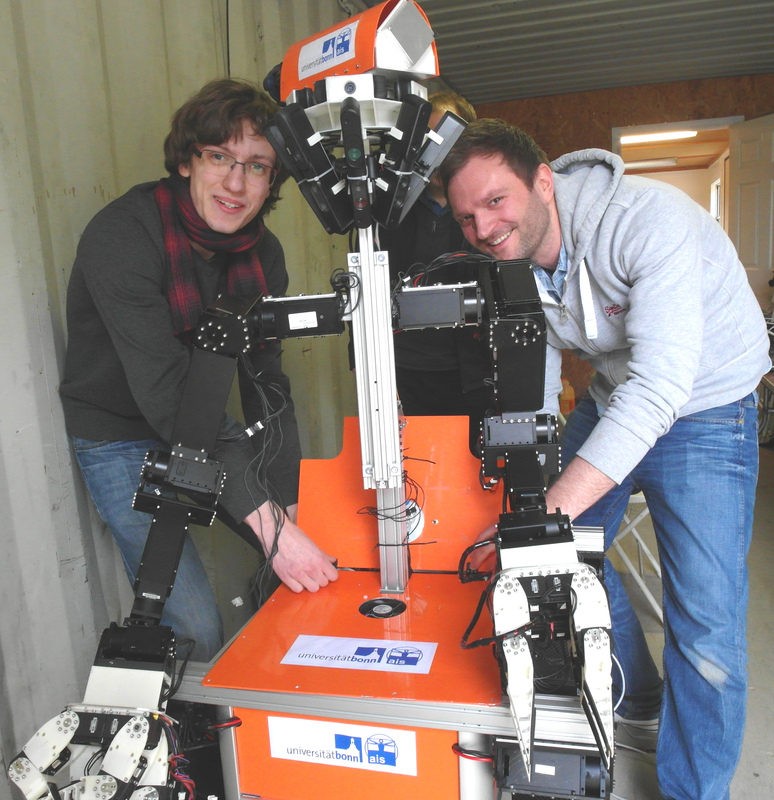 It appeared in volume 34, issue 2, pages 400–425, March 2017.
has been accepted for the IEEE-RAS International Conference on Humanoid Robots (Humanoids), Seoul, Korea, to appear November 2015. 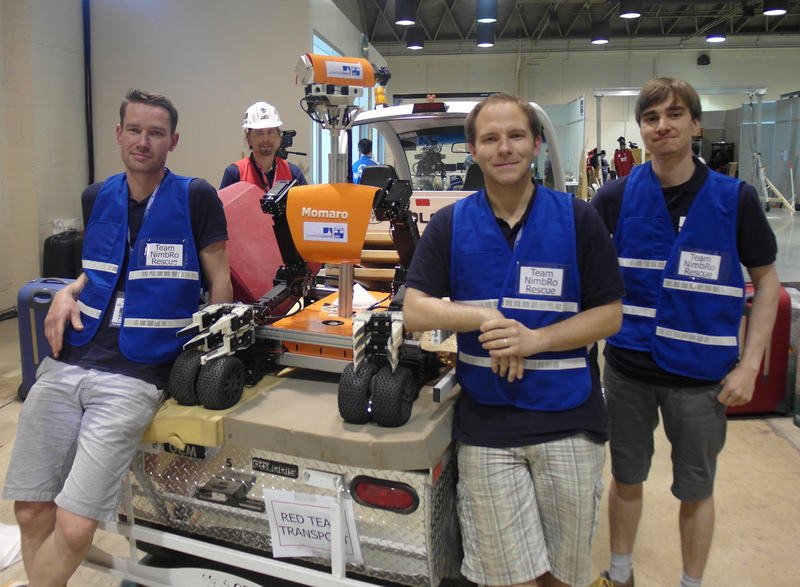 Our team NimbRo Rescue was the best ranked European team in the DARPA Robotics Challenge, comming in 4th in the overall ranking. 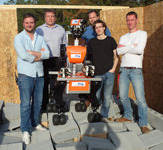 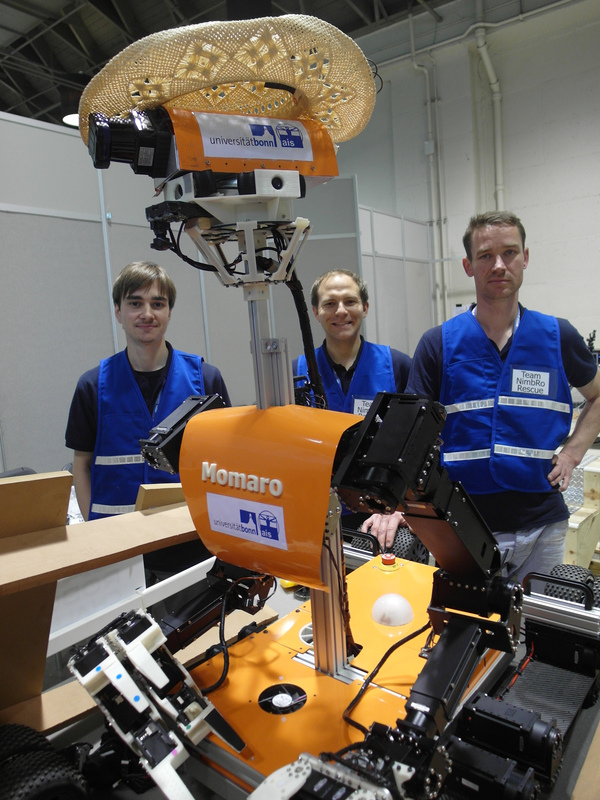 The robot Momaro and its operator crew solved seven of the eight possible tasks in only 34 minutes. 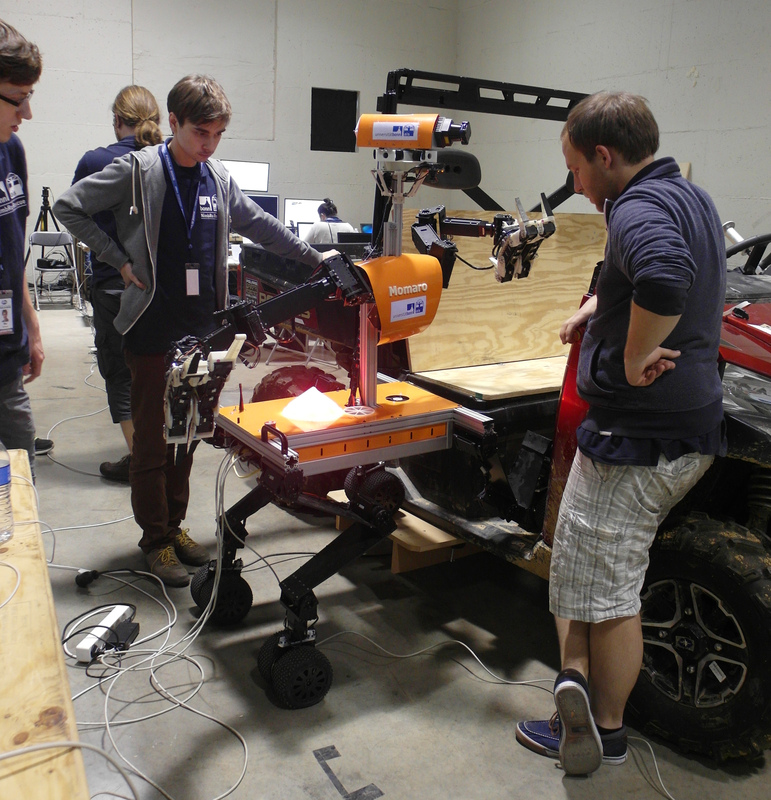 The challenge was won by team KAIST from Korea, followed by team ihmc from Florida, and team Tartan Rescue from Carnegie Mellon University. Our robot Momaro practiced the surprise task for the final run, which is to pull a plug from one socket and to place it in another socket. 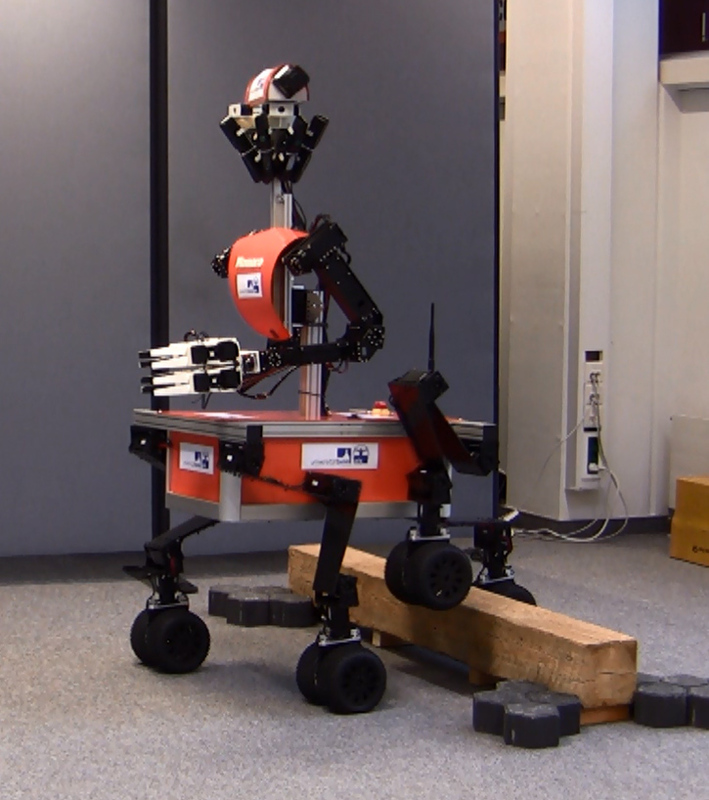 It aso practiced climbing the stairs. 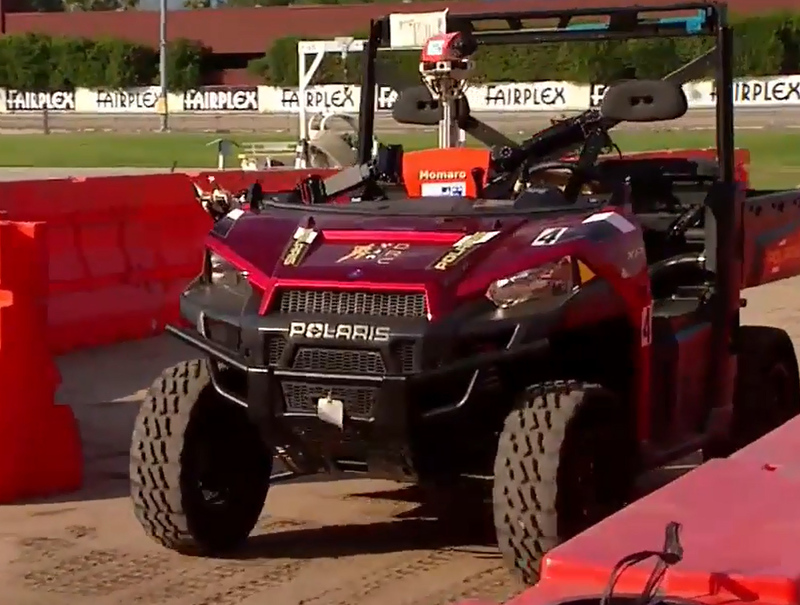 In the run, the robot drove the car perfectly. The egres motion was stopped and the rules did not allow a second attempt of egressing the car. 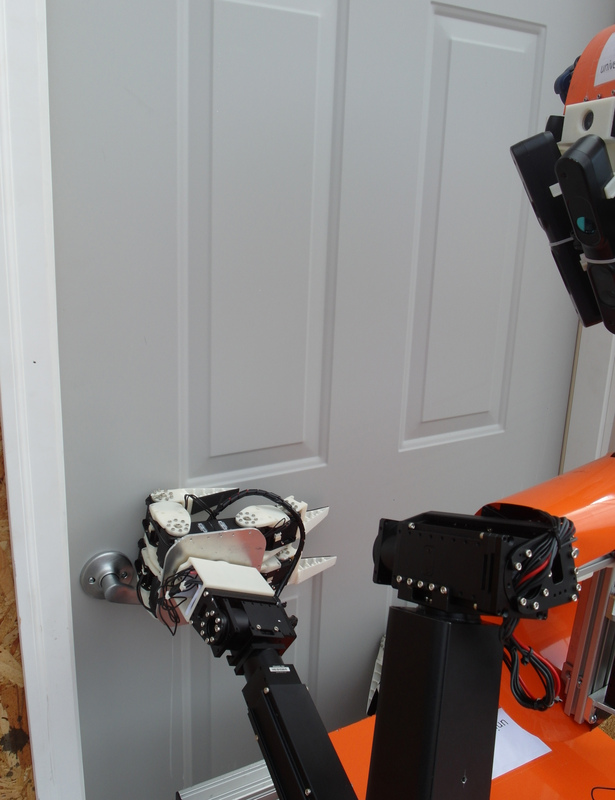 After opening the door, Momaro turned the valve and solved the surprise task. 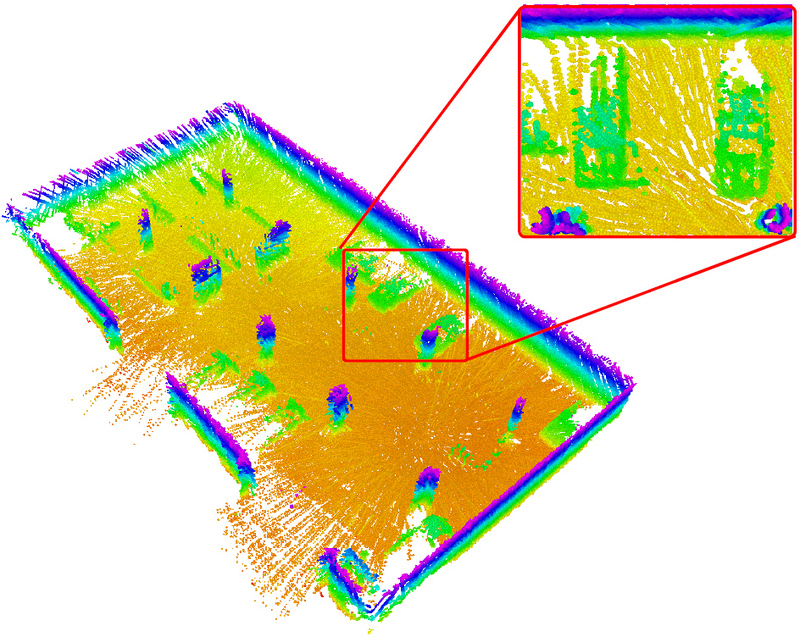 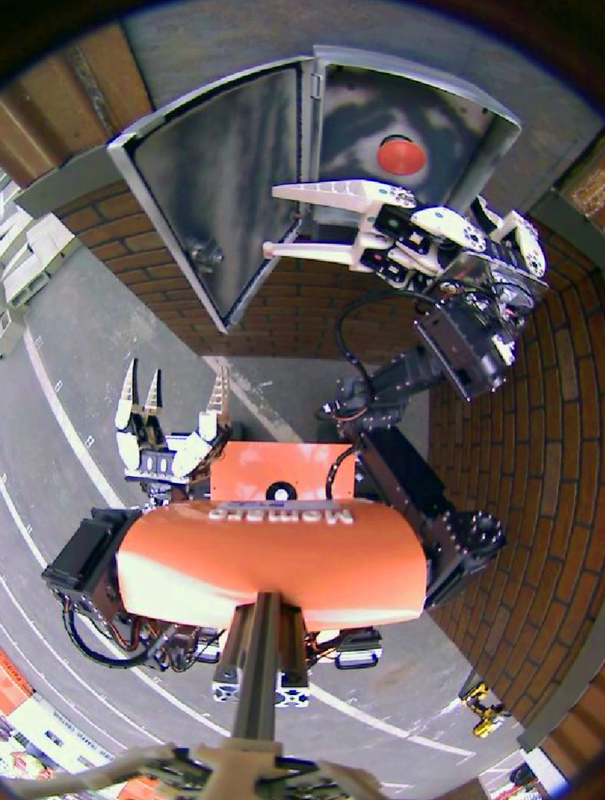 When traversing the debris, oue robot got stuck which resulted in overheated actuators. 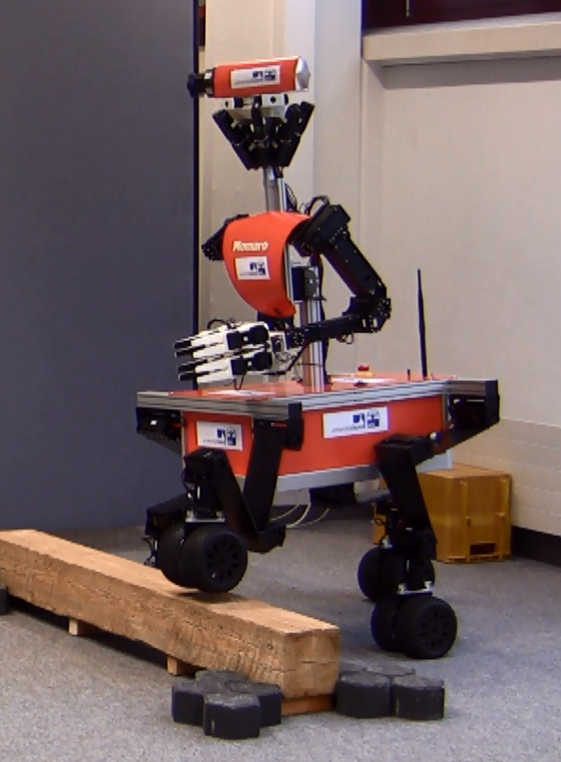 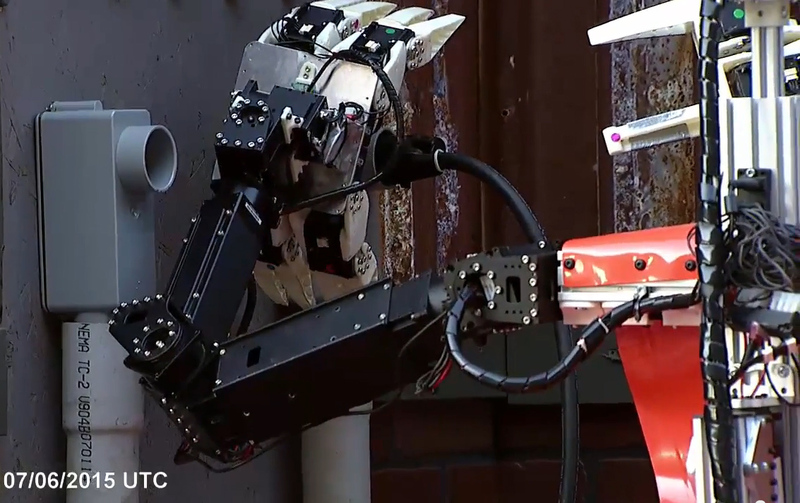 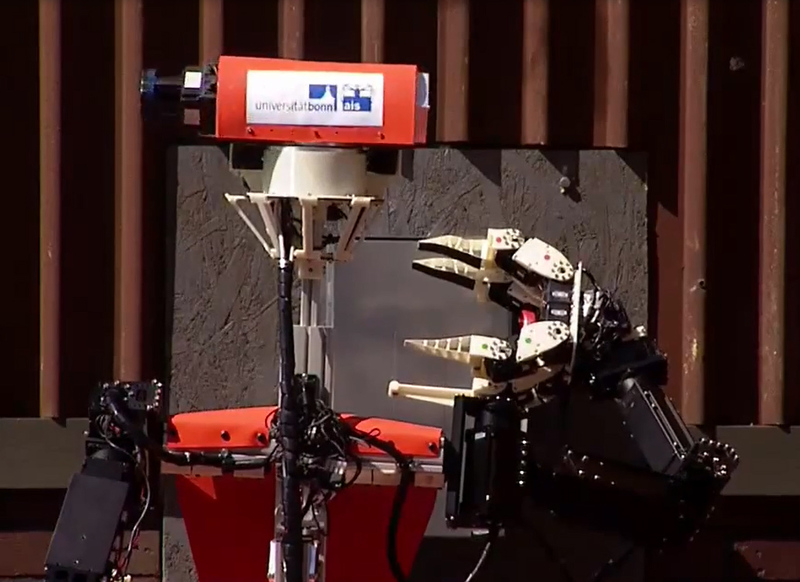 It was only partially possible to revieve the robot, which scored the point for the devbris task by moving a heavi piece away with its gripper and waving a good buy to the audience. 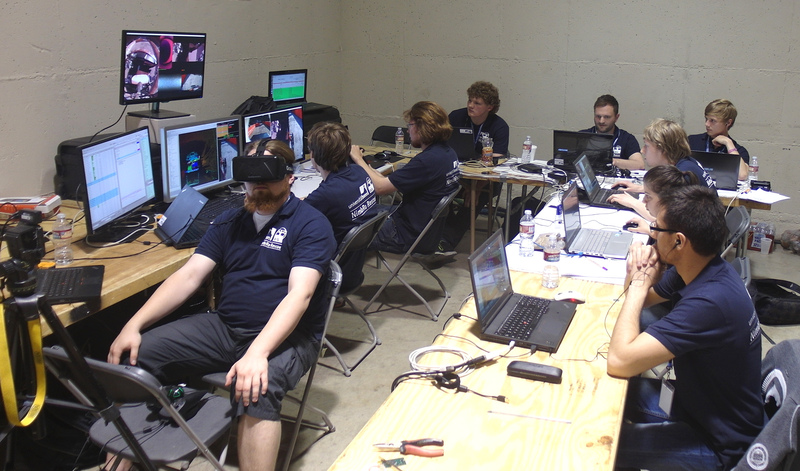 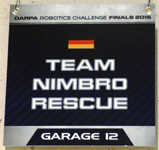 Our team NimbRo Rescue did very well at the first competition day of the DARPA Robotics Challenge Finals. 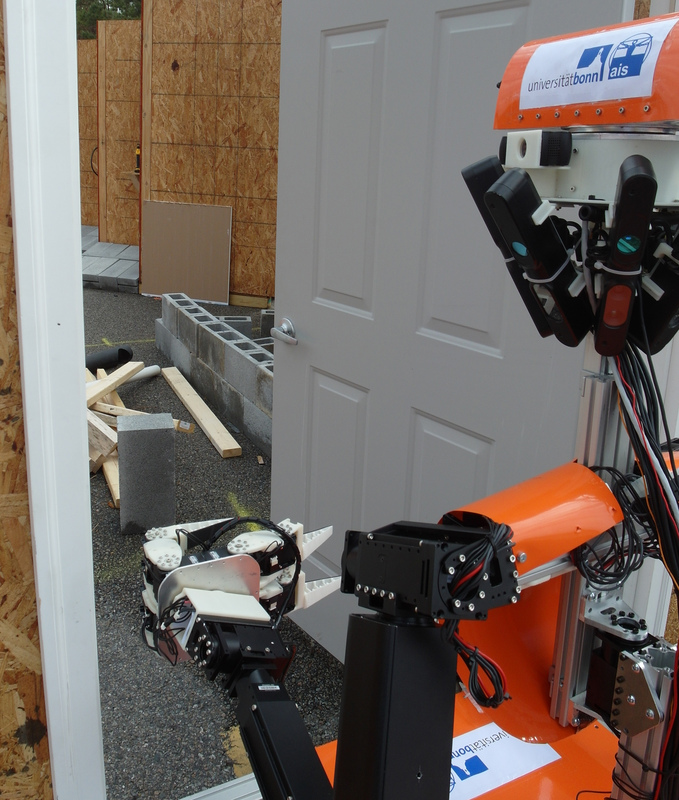 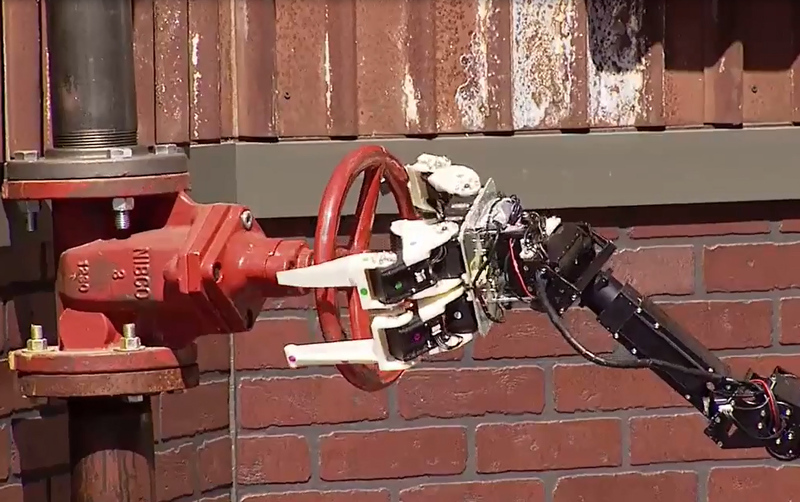 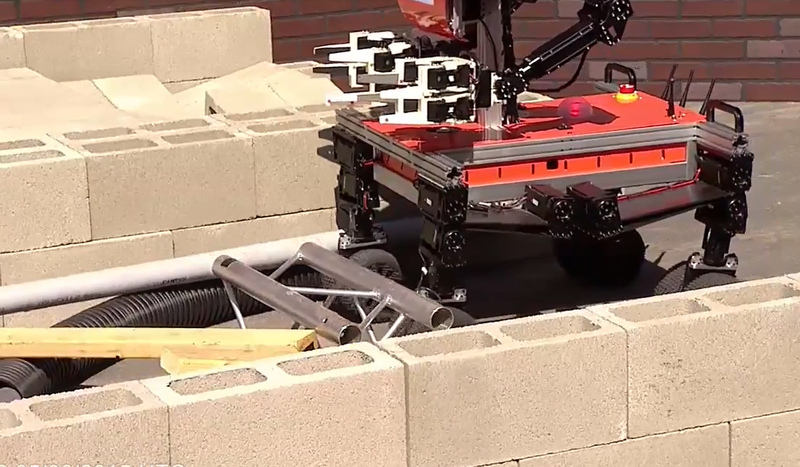 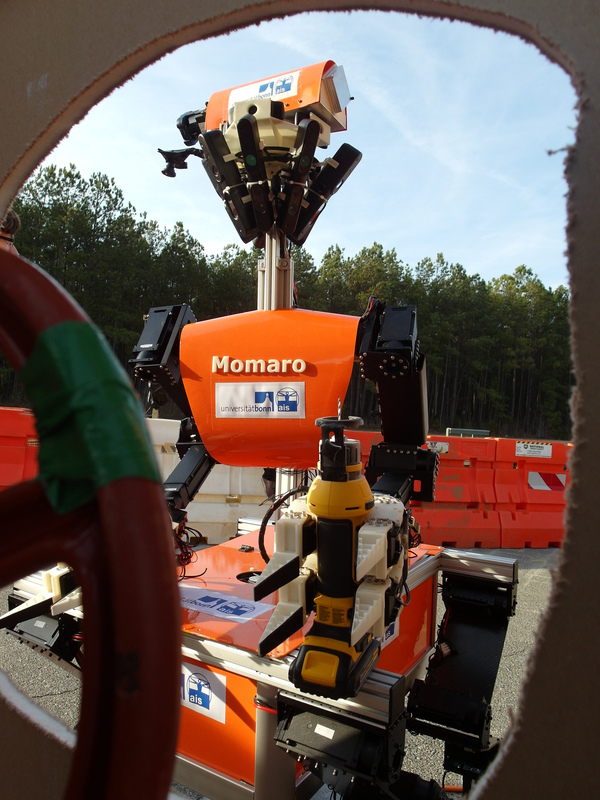 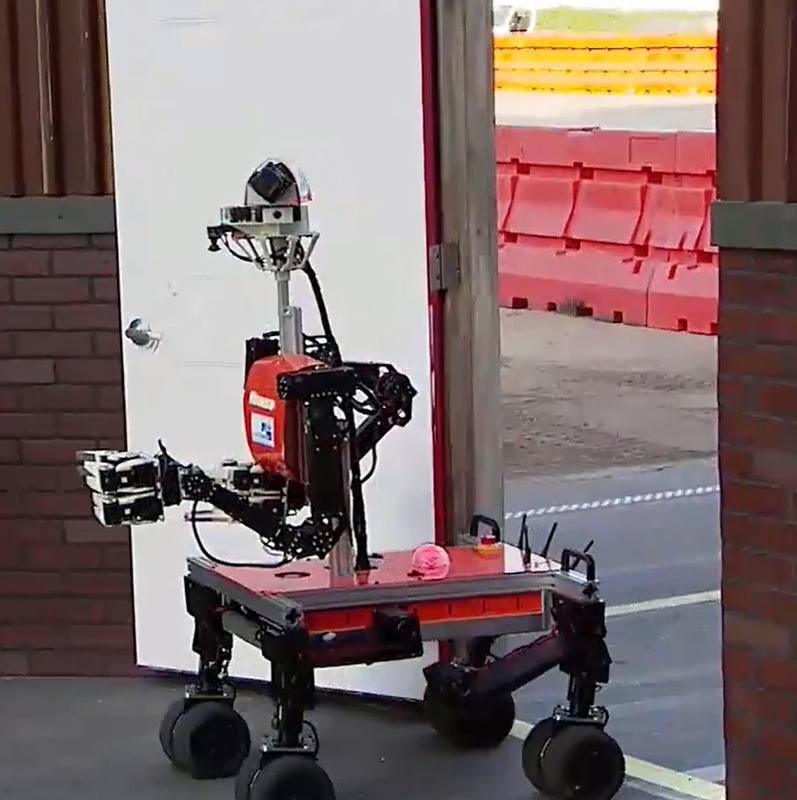 The Momaro robot solved seven of the eight tasks: driving the car, climbing out of the car, opening the door, turning the valve, cutting a hole in a drywall,traversing debris, and the surprise task, which was to operate a big switch. 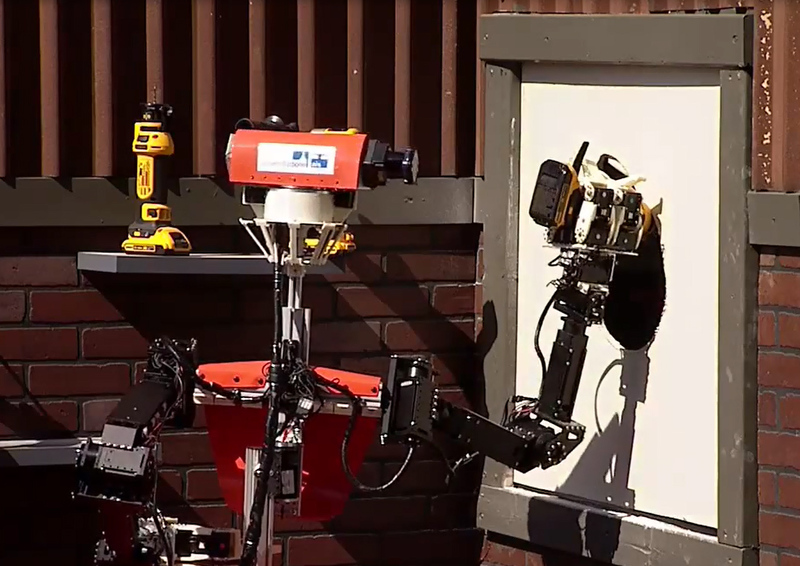 All this was done in only 34 minutes. 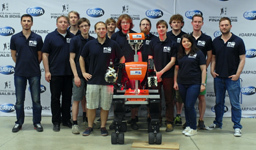 Our team is currently second in the ranking, next only to team Tartan Rescue of Carnegie Mellon University. 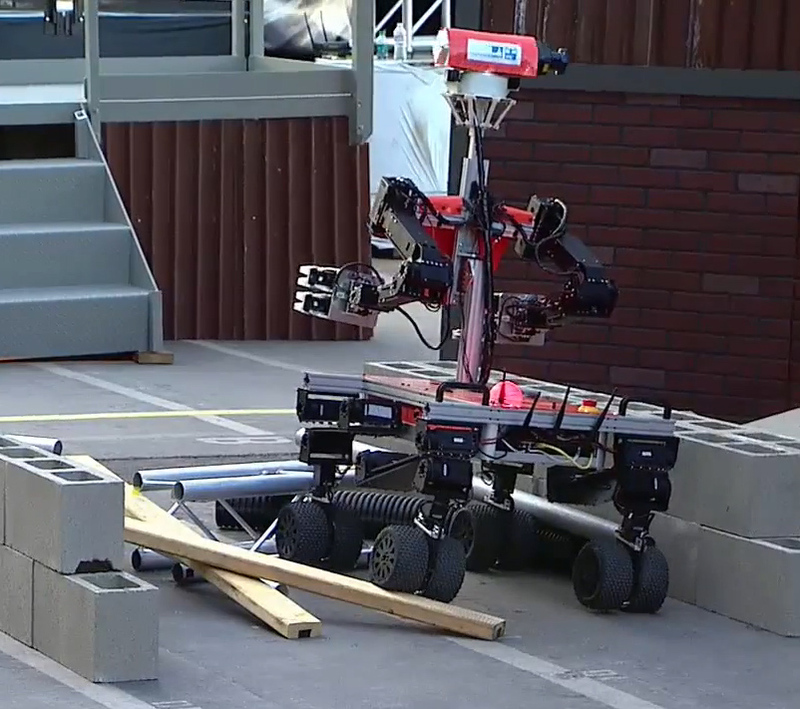 Tomorrow, all teams will have a second run. 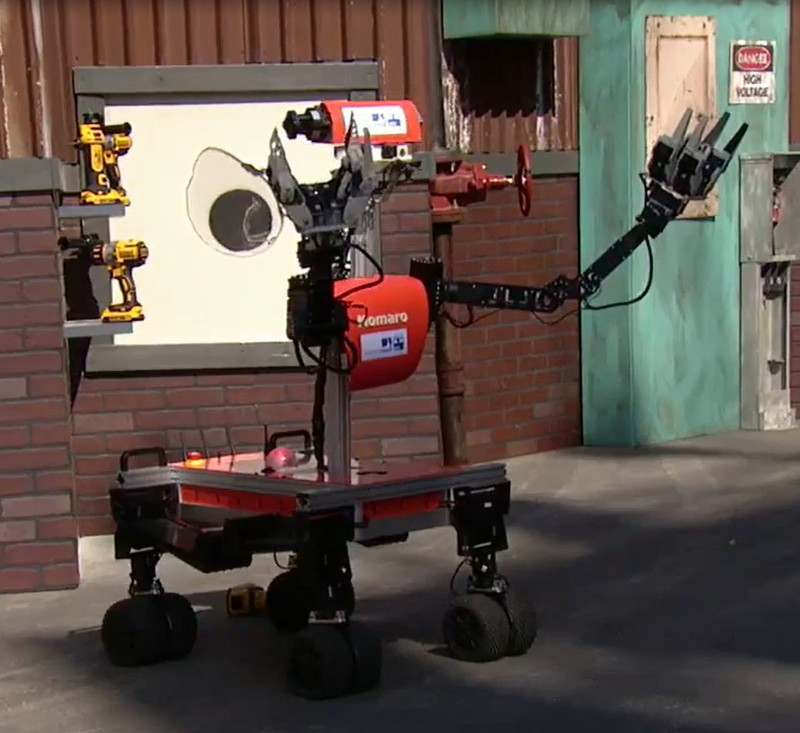 The better of the two will determine the final ranking. Today, our robot Momaro had a chance to practice the tasks in a realistic rehearsal run. 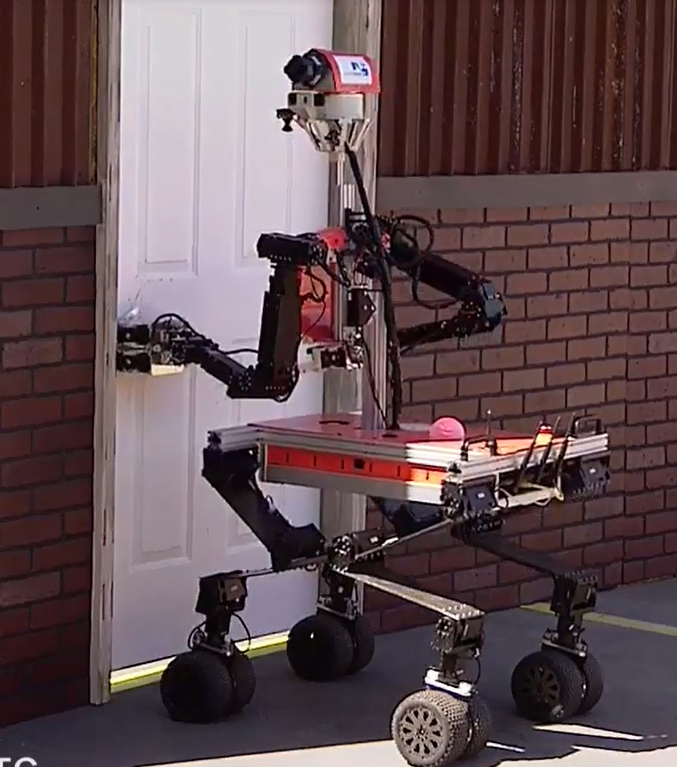 The test went well. 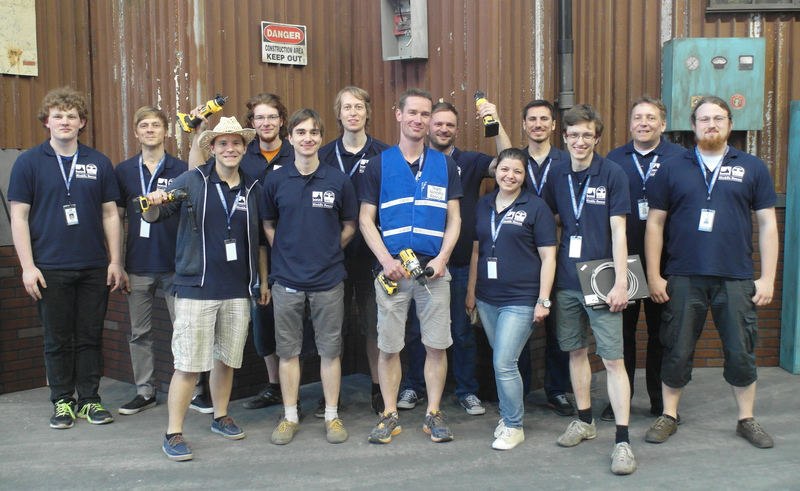 We solved six out of eight possible tasks: Driving the car, climbing out of the car, opening the door, turning a valve, traversing debris, and finaly a surprise task: open a cabinet door and pushing a button. 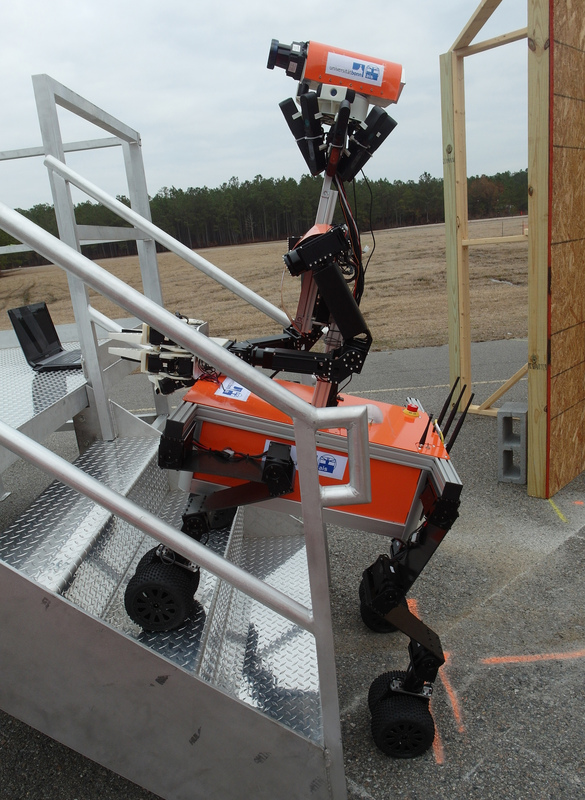 DARPA gave us the opportunity to test their network, including degradation of communication. 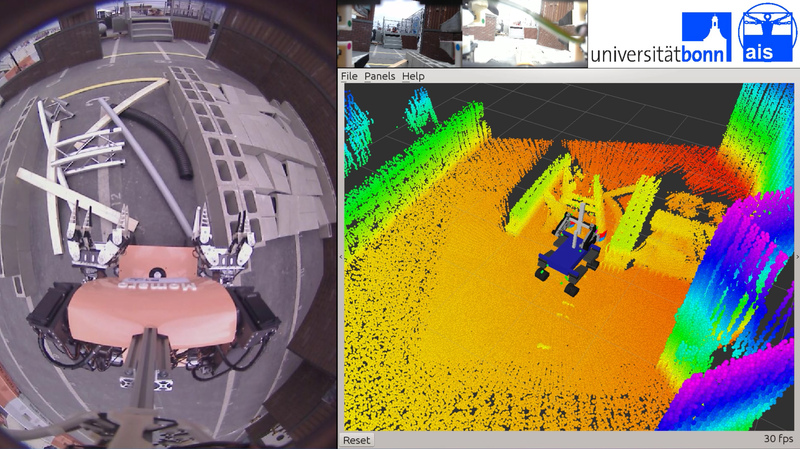 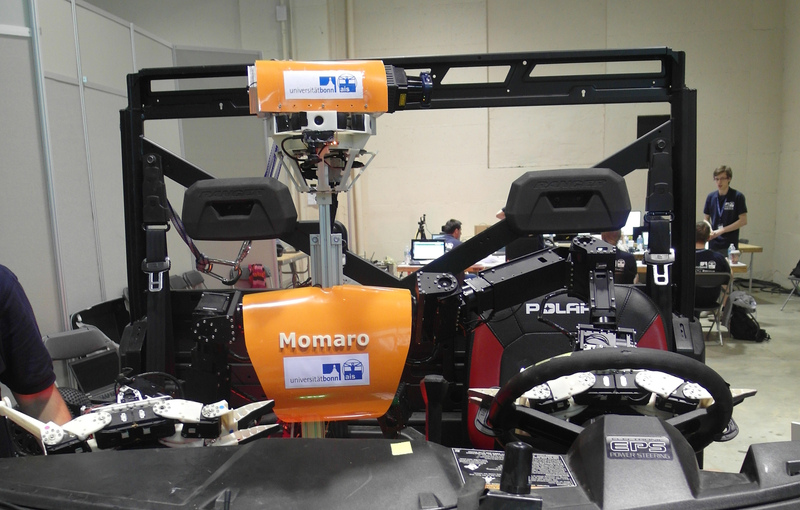 Our robot Momaro practiced the Egress task by climbing backwards out of the car. 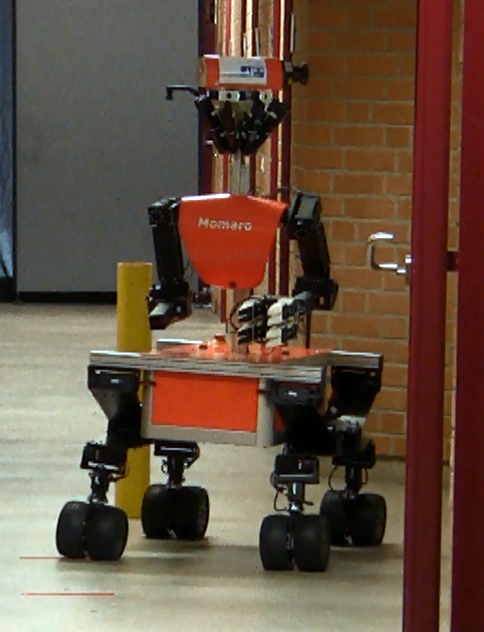 Our robot Momaro practiced the car task in the Garage today. 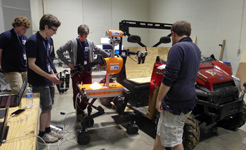 The robot was inspected and and safty procedures were clarified. 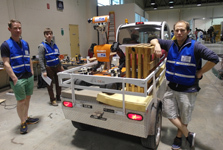 DARPA made official photos of our team and the Momaro robot. 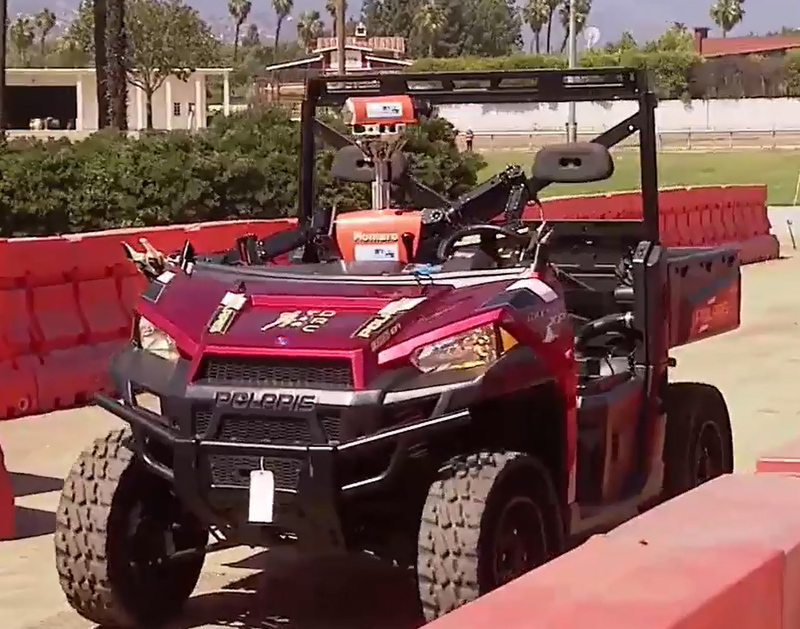 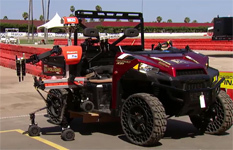 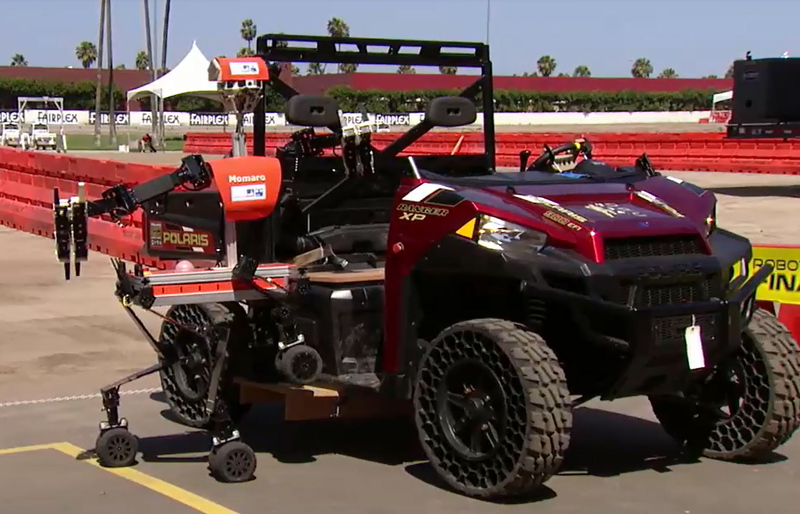 Our team NimbRo Rescue participates at the DARPA Robotics Challenge at the Fairplex in Pomona, CA. 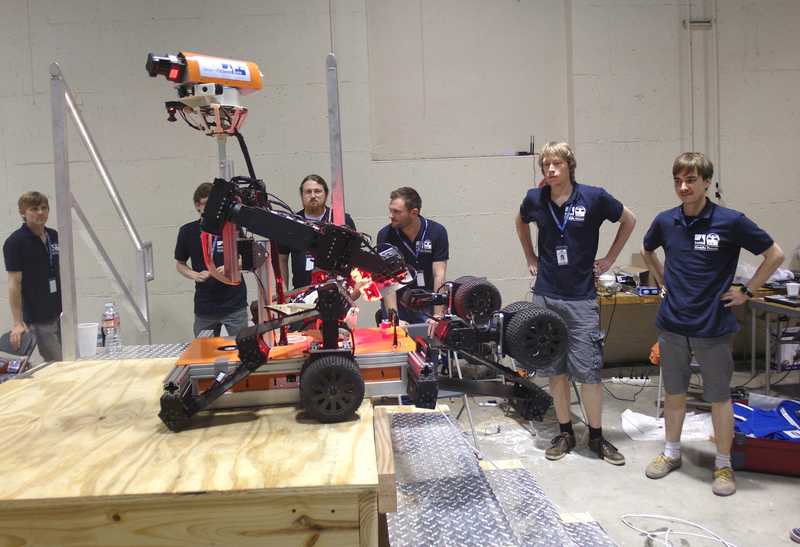 We moved into our team garage to re-assemblde the Momaro robot and tio setup the operator station. 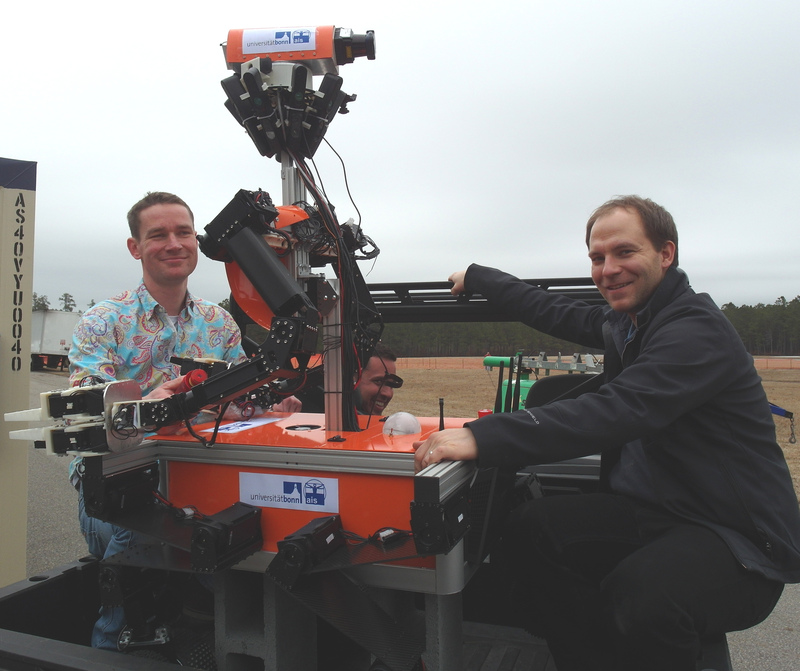 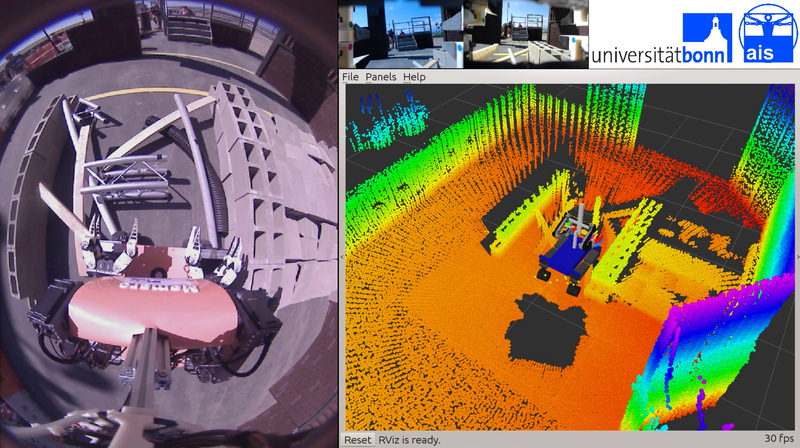 Our team Nimbro Rescue participates at the DRC Testbed in Charleston, South Carolina. 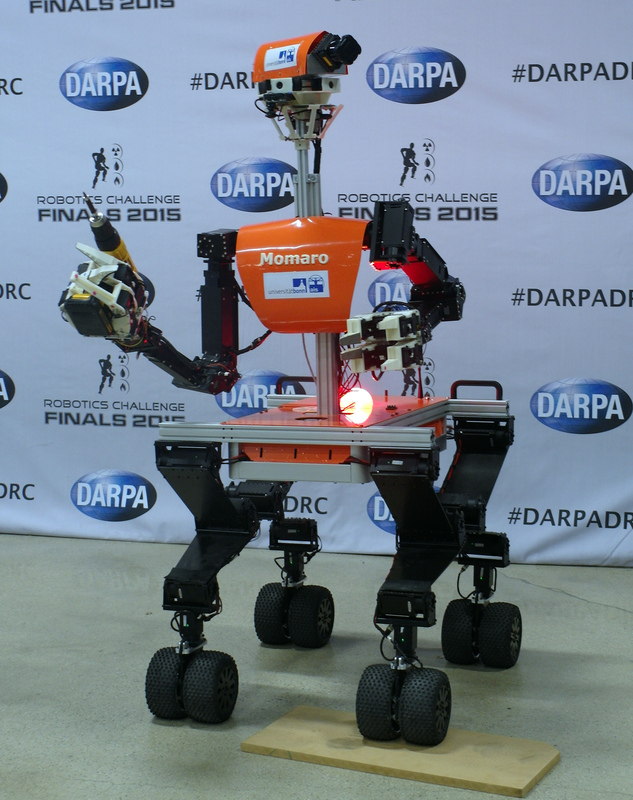 Here, DARPA provides four test arenas which are similar to the ones that will be used in the finals. 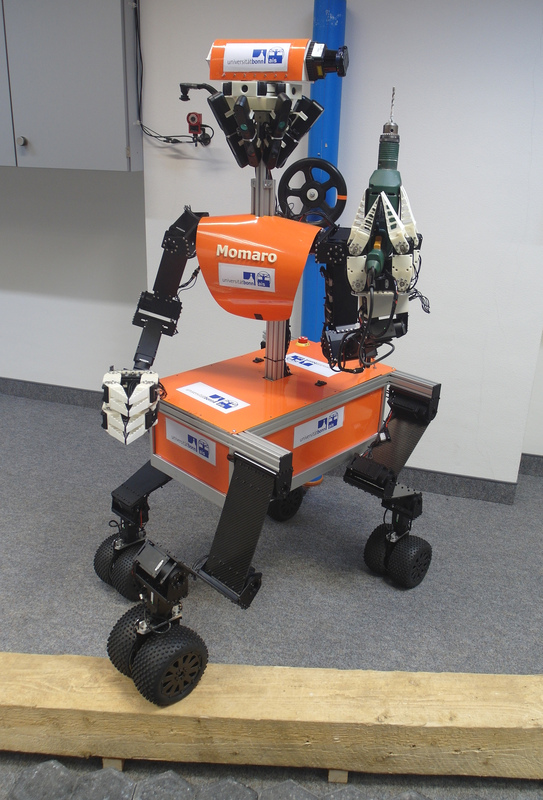 We operated our robot Momaro in one of the arenas, recorded sensor data, and tested the provided communication infrastructure. 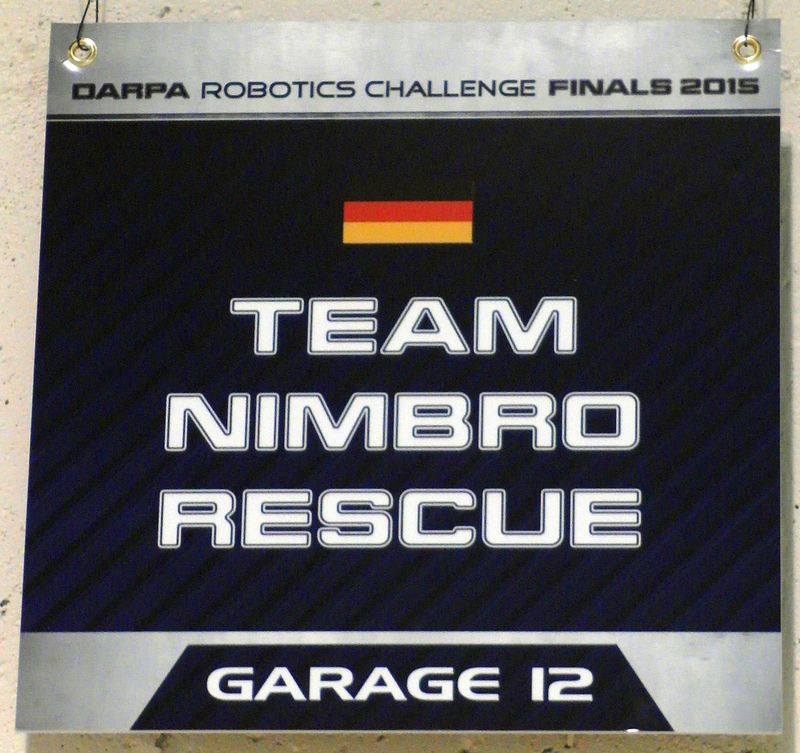 Our team NimbRo Rescue submitted qualification material for participation at the DARPA Robotics Challenge (DRC) Finals, which will take place June 5-6, 2015 at the Fairplex, in Pomona, California, USA. 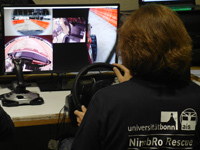 Team NimbRo Rescue is based in the Autonomous Intelligent Systems Group at the Computer Science Institute of University of Bonn, Germany. The University of Bonn is one of the leading public research universities of Germany. 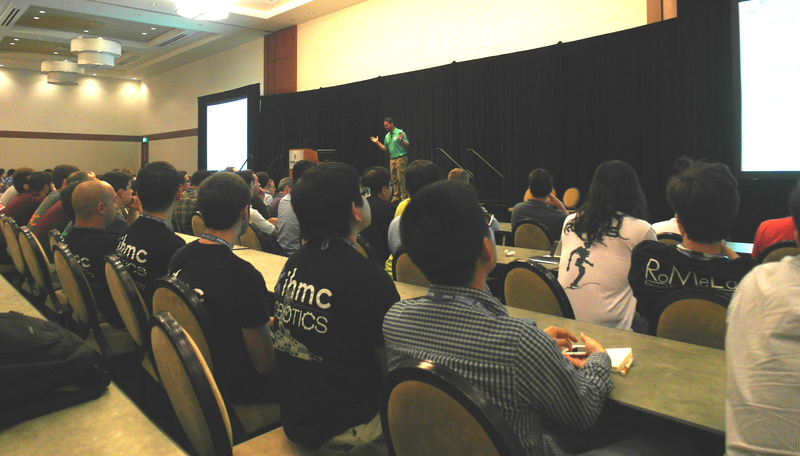 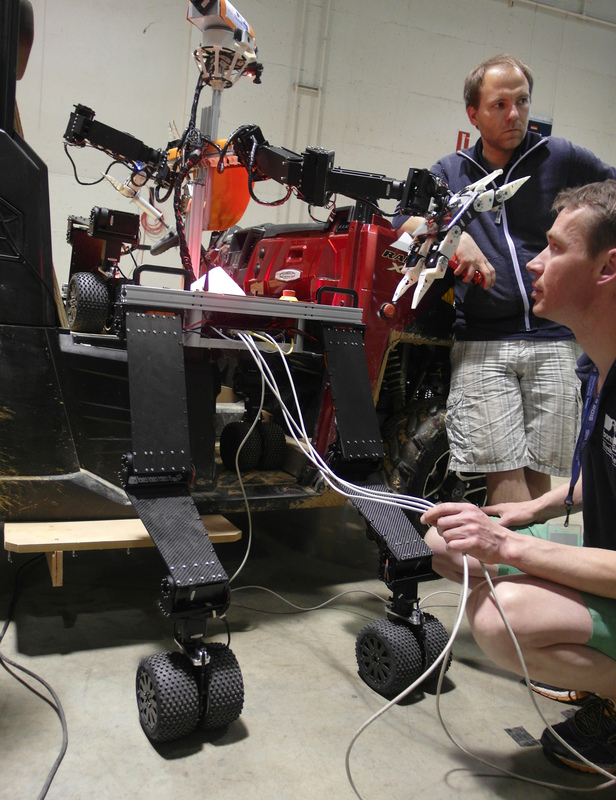 Its Computer Science Institute has a long tradition in robotics research, especially in the areas of mobile robotics and SLAM. 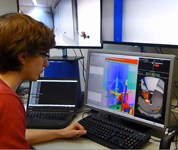 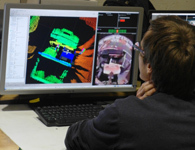 Since 2008, the Autonomous Intelligent Systems (AIS) group conducts research in cognitive robotics and machine learning. 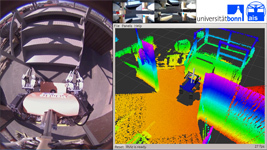 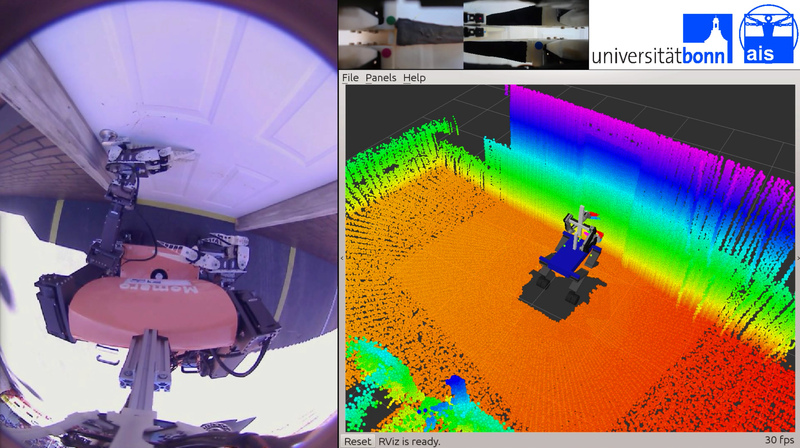 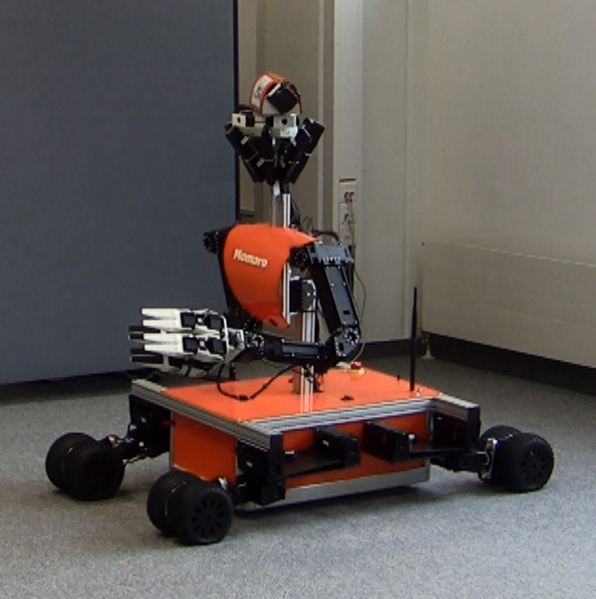 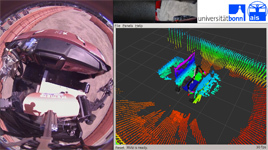 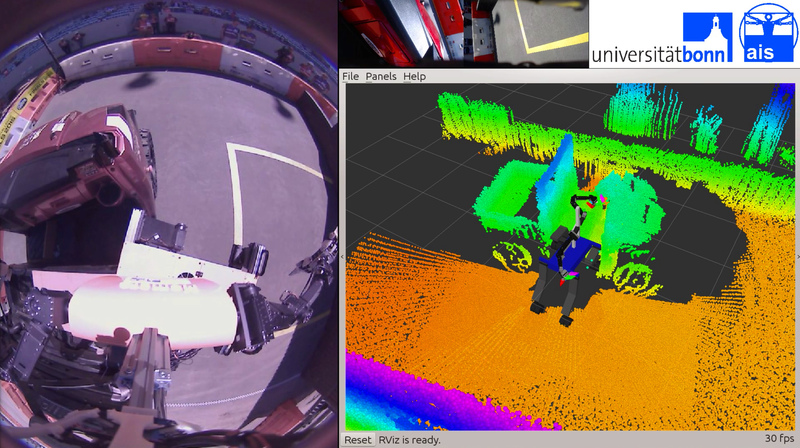 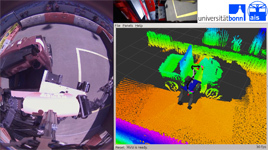 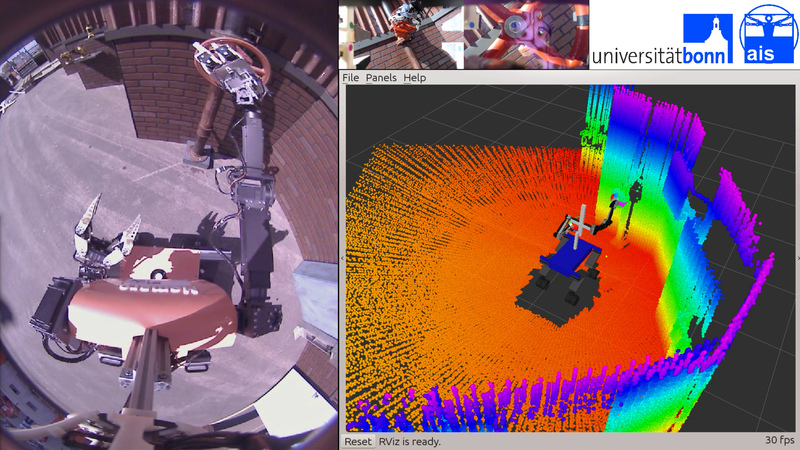 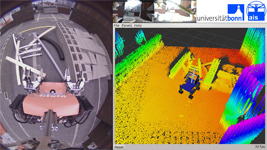 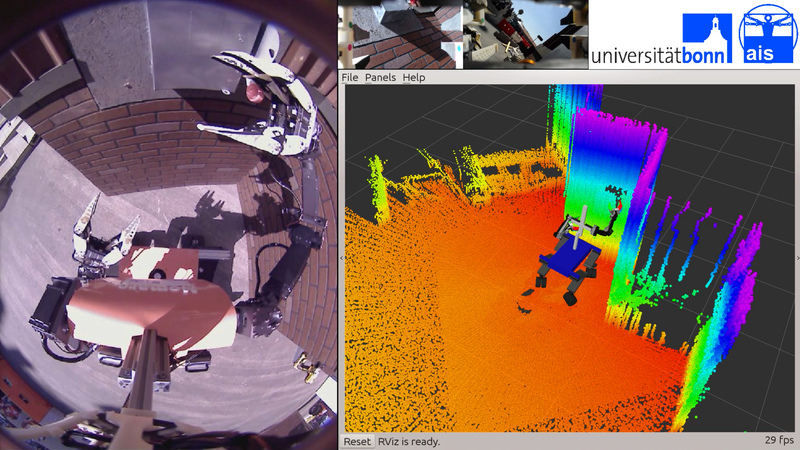 The AIS group has extensive experience in real-time perception, control, and system integration for complex robots, including robots for semi-autonomous exploration and manipulation in rough terrain, autonomous service robots capable of mobile manipulation and intuitive human-robot interaction in complex environments, and micro aerial vehicles for autonomous navigation in restricted 3D environments. 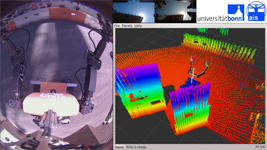 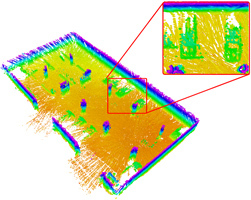 We developed advanced methods for laser-based and RGB-D 3D SLAM, semantic mapping, and planning for navigation and manipulation, tool use, and robot teleoperation. 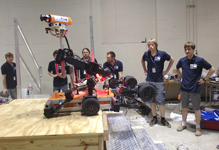 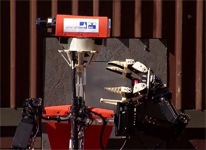 The AIS group has extensive experience in robot competitions and challenges. 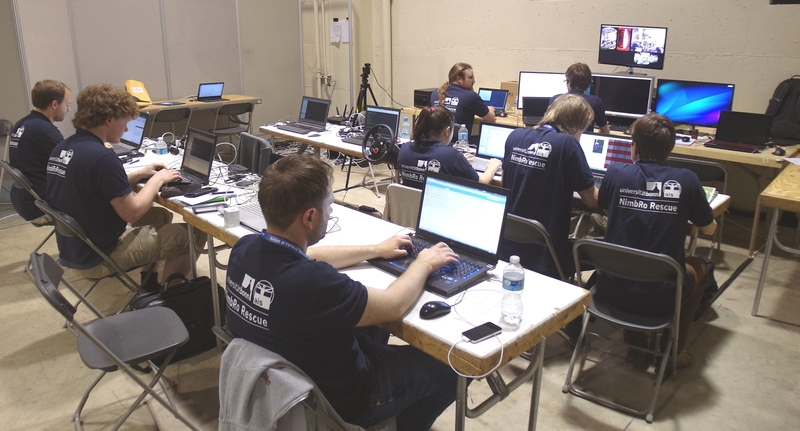 Our team NimbRo participated with great success at the international RoboCup competitions, winning a total of 13 tournaments, including five consecutive years of the Humanoid TeenSize soccer league and the three consecutive years of the @Home domestic service robot league. 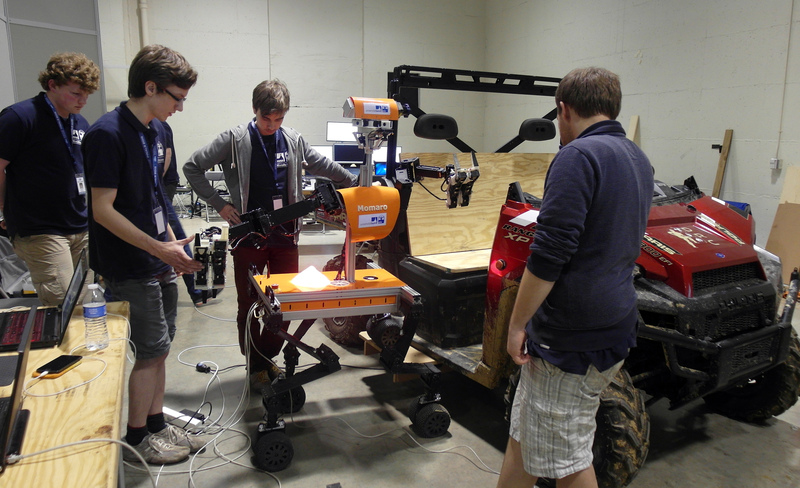 We also developed a robot for mobile manipulation in rough terrain, which participated at the DLR SpaceBot Cup. 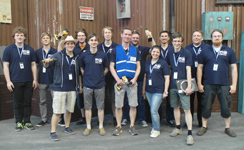 Our teams NimbRo Manipulation, NimbRo Logistics and NimbRo Copter are qualified for the European Robotics Challenges. 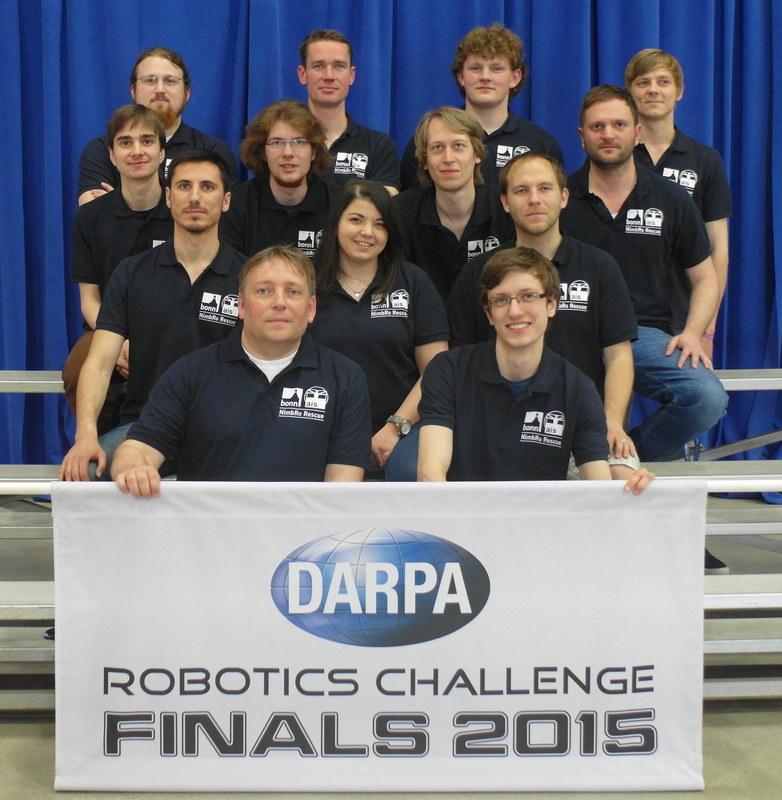 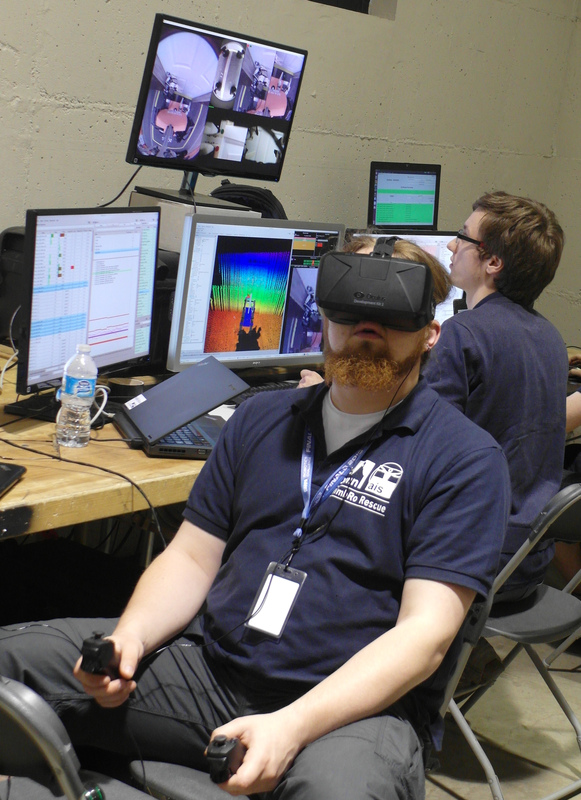 Our team has the necessary expertise to address the objectives of the DARPA Robotics Challenge. 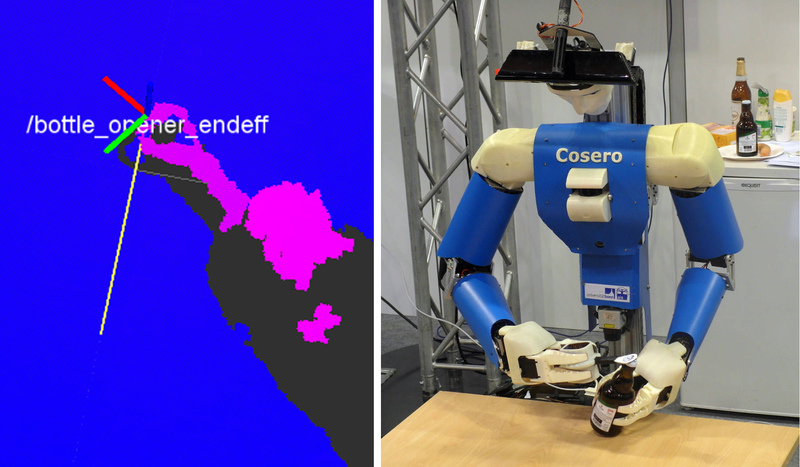 In Proceedings of 14th IEEE-RAS International Conference on Humanoid Robots (Humanoids), Madrid, Spain, 2014. 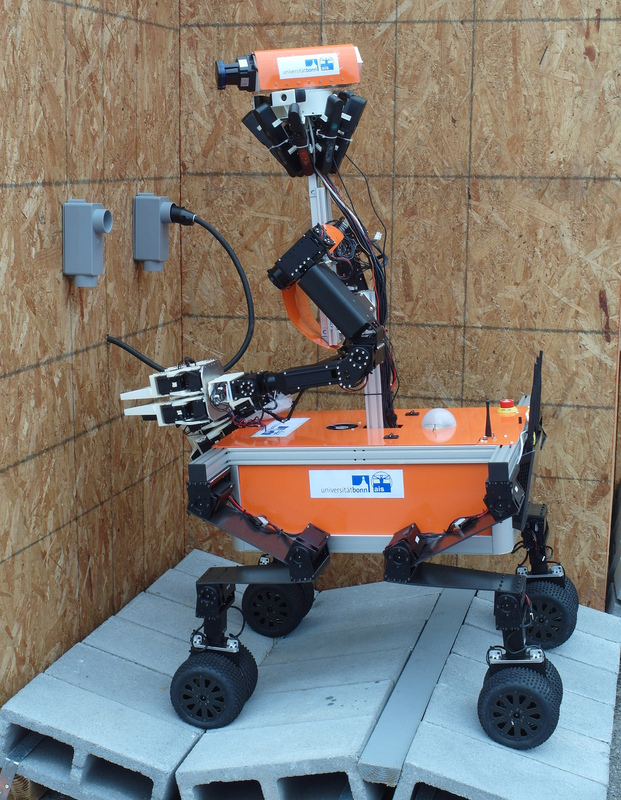 Journal of Field Robotics 33(4):411-430, Wiley, 2016. 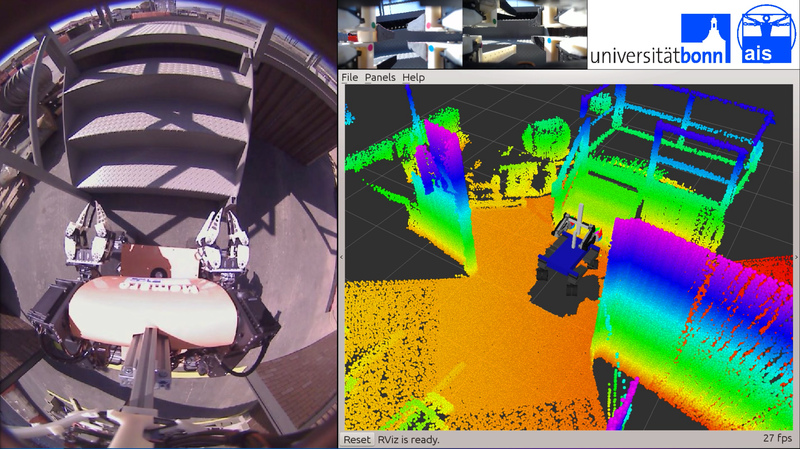 In Proceedings of 13th International Conference on Intelligent Autonomous Systems (IAS), Padova, Italy, 2014. 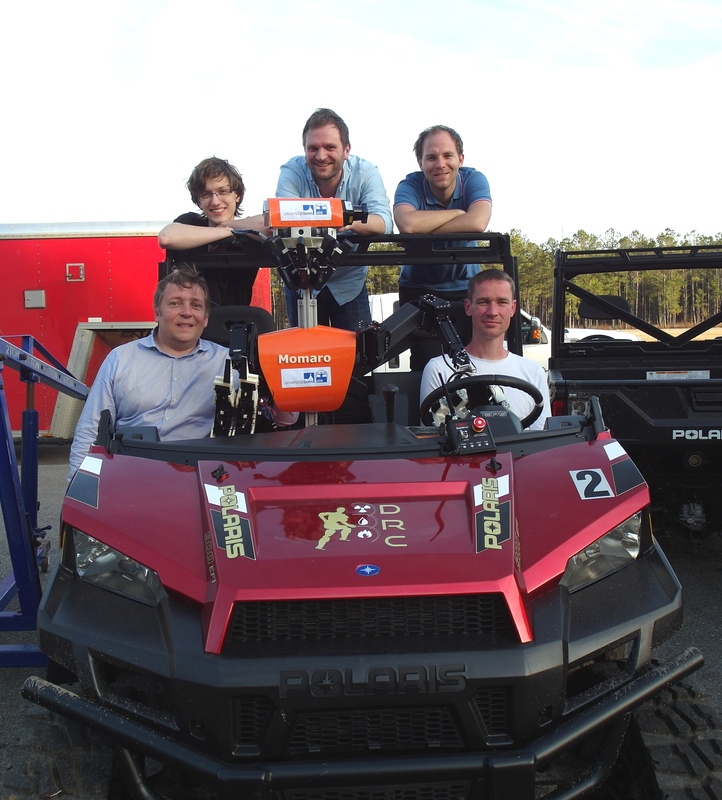 Our team NimbRo Explorer participates at the DLR SpaceBot Cup. Our team NimbRo@Home won the international RoboCup@Home competitions for domestic service robots three times in a row (2011-2013). 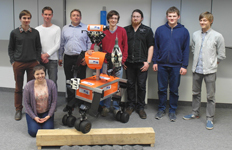 Our team NimbRo TeenSize won the Humanoid TeenSize class of the international RoboCup competitions for soccer robots five times in a row (2009-2013). 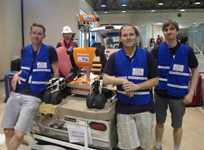 Our teams NimbRo Manufacturing, NimbRo Logistics, and NimbRo Copter are qualified for the European Robotics Challenges (EuRoC).